I am so excited about this card. 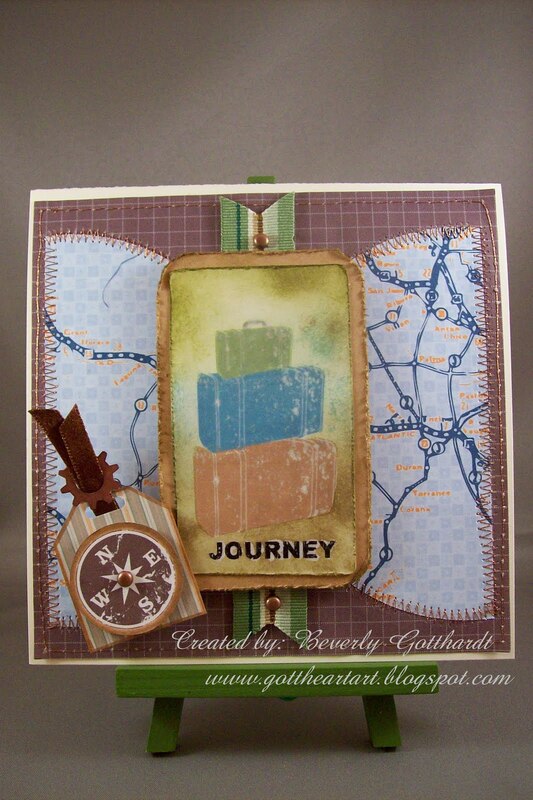 I used Stampin Up's My Digital Studio Sentimental Journey Design Kit to create the papers and stamps used on this card. All digital except for the ribbon, brads, and my little cog on the tag. I punched it with my new Cog Punch also Stampin Up, and of course the inks I used to distress the luggage tag in the middle. At Our Creative Corner we were to choose a Design Team member and CASE one of their cards, but change at least 2 things. I chose Linda-The Funkie Junkie. I've been an admirer of hers' for a while now. She forced me to get out my sewing machine and sew on my cards. Alas, I'm not as proficient as she is, but I have made a valiant effort not to shame her in my endeavor. I chose her Happy Travels card from June 23rd. I didn't pull her card onto my blog so you'll have to read my list of things I changed and then hop over to her blog and see not only the Happy Travels card, but also the rest of her wonderful art. 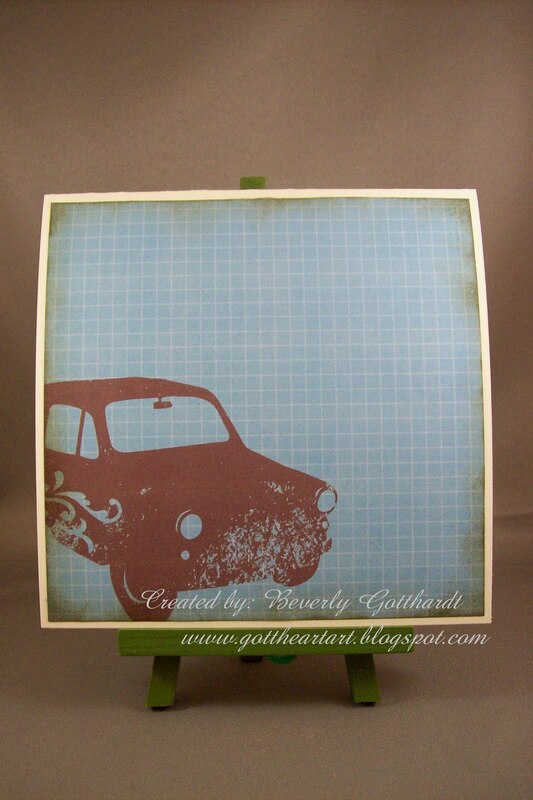 I used her sketch, but changed the papers, stamps, I used copper metallic thread to sew with, colors slightly. I think that's all. Kind of like it, but slightly different. Thanks for all your inspiration Linda! The other challenge I'm entering this in is Daisy Doodles Callenges, they use digi's only in their challenges and the one for this week is "Summertime". I'm going to use this card to welcome home some friends from their summer vacation. Daisy Doodles Creative Challenges " Summertime"
Supplies: 5 1/2" square card Very Vanilla, Papers: Stampin Up-Creamy Caramel, Very Vanilla, Stamps and all other papers created in My Digital Studio, Ink: VersaMark Pen, Sakura Copper Paint pen, Ranger Distress Inks-frayed burlap, peeled paint, broken china, Stampin Up clear embossing powder, American Crafts-small copper brads, ribbon-Michael's and Offray, Stampin Up punches-1 1/4" circle, Ex.Lg. Cogs, Horizontal, EK Success sm. corner rounder, Fiskars-Lg. circles and Rectangle shape cutter templates, glue dots, pop dots. Very unique and I like it! Thank you for joining in the challenge at Daisy Doodles. LOVE this Beverly. I think you did an amazing job with your CASE - can't believe you even found a suitcase stack image to use! I had so much fun making that card - hope you did too (especially with the sewing part - LOL). Thank you for your kind words about my work and for choosing me as the OCC girl to CASE. So happy to see you joining in the fun with us this week. This is so creative! I love it! Thanks so much for playing with us at Daisy Doodles. Fab Card! Thanks for joining us this time at Daisy Doodles! !